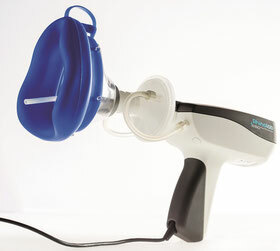 4-Phase rhinomanometry is the determination of the nasal airway resistance by measurements and subsequent calculation of parameters, which are representing the energetic of nasal breathing. Classic rhinomanometry and its derivations ( e.g. resistometry or others) are estimations of presumed parameters. This leads in a high number of cases to erroneous conclusions about the fluid dynamics ar energetic of nasal breathing. 4RHINO realizes as the preceeding types HRR 2,3 and HRR 2000 the principle of combining a specific hardware, placed in a small device, with a WINDOWS compatible computer. Following the experience of the users the firmware is permanently upgraded. The principles of data acquisition, averaging and evaluation are proofed through more than 20 years. The formate of data is downwards compatible, providing the data exchange between different users and the evaluation of pooled data by wide spread statistical programs as SPSS or MS Excel. The 4RHINO-System is compatible with MS Windows XP, 7, 8 and 10. Because of the permanent progress in computer technology and because of the indivdual safety regulations in medically used networks, it is recommendable to use the 4RHINO-system in combination with pre-installed notebooks or the installation of the software in networks supported by our service. Results are edited following the ISCOANA Standard of 1984 to enable comparing with older devices or references, furthermore with the typical 4PR values LogREFF and LogVR. The entire possible range of values is depicted.Subjective complaints are recorded by means of a VAS scale. All parts in contact with the patient are sterilizable or disposable.A standard anesthesiological filter with CO2-port is applied. The device is following respective international prescriptions. The connection between pressure tube and nostril follows the “tape-method” as recommended by ISCOANA since 1984, which avoids errors by deformation of the nostrils by preformed adapters. The function of the nasal valve is fully preserved, providing the additional diagnostic information of 4-Phase rhinomanometry. Updates of the installed software are available through or website or software service. A calibration control or re-calibration is only necessary for devices delivered up to 2012. Starting in 2013, 4RHINO is equipped with digital sensors, which do not have to be re-calibrated. Detailed information can be obtained from the actual downloadable manuals.